Mespilus. (The Latin name for this fruit.) MEDLAR. Rosaceae. One species, a deciduous tree or shrub, to 5m. Bark grey-brown, fissured, sometimes flaking. Branches arching, divaricate; branchlets light brown-tomentose at first; thorny in the wild, usually thornless in cultivation. Leaves to 12cm, alternate, oblong-lanceolate, short-acuminate, dull green above, tomentose beneath, serrate, yellow and rufous in autumn; petioles very short. Flowers white, to 5cm wide, usually solitary, sometimes paired; pedicels languinose; calyx tomentose, lobes 5, pubescent, lanceolate-acute, incurved, persistent; petals 5; stamens usually 25-40. Fruit turbinate, to 2.5cm, brown when ripe, crowned with the five calyx lobes, showing the transecting ends of the bony seed vessels. Spring-summer. Europe, Asia Minor. Related to Crataegus and Cotoneaster, but flowers large and solitary, and fruit with five carpels. 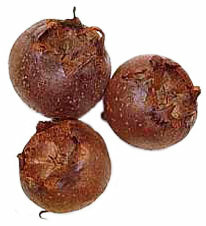 The medlar, Mespilus germanica is indigenous through much of Europe and is thought to have originated from Transcaucasia. It is occasionally found growing wild in hedges and thickets, even in southern England, but this is considered likely to have resulted from garden escapes. Only ever of minor horticultural importance, it was grown in Asia Minor, Greece and Rome whose ancient writings occasionally make reference to it. The French introduced it to North America in the 17th century and medlars are sometimes used for garden hedging in Florida, where escapes are also found in the wild. Charlemagne's list of fruits in the year 800AD includes the medlar, and in England it appears in some Westminster Abbey records for 1270AD and again in others connected with Henry VIII. There is a German reference (Heresbachins 1577AD) to the wood of the medlar being used for making wheel spokes. Greater use of medlar fruits appears to have occurred on the European continent, particularly in the Middle Ages, than in Britain, and this still holds good though on a reduced scale. In France they were the main ingredient of a much-prized preserve, whereas in Britain they were preferred following a meal and complemented by port wine. The fruit, which is flattened, apple-shaped and with a wide, open eye, should be kept until part-rotten (bletted) to enjoy maximum flavour, one which is an acquired taste. Picking should be delayed until late October or early November and the fruit stored eye downwards in dark, cool conditions for a short while to ripen fully. Only three cultivars are widely listed: ‘Dutch’ with large flowers and foliage and fruits up to 6.5cm in diameter and markedly flattened, but with only fair flavour; it dates at least from the 17th century. The smaller-fruited ‘Nottingham’ has a finer flavour and more upright growth; it is thought to be one of the earliest selections of the common wild medlar. Little of any attention has ever been given to breeding new cultivars, the only notable introduction being ‘Royal’, introduced by Thomas Rivers from France in 1860; it has medium-sized fruits. There is a seedless cultivar called ‘Stoneless’, but its fruits are very small and of poor flavour. Medlar trees will succeed on any reasonable moisture-retentive soil; an organic mulch annually in spring gives best results. Tree size will be medium (approximately 5.5-6m) on quince rootstock, perhaps 7-7.5m on seedling pear. A bush is the most practical tree-type, trained as for bush apple although it is also grown as a round headed standard, which will need staking for several seasons until established. Occasional tidying and thinning of branches is the only pruning necessary on established trees, with particular attention to removal of the crossing branches which seem to arise as a consequence of the natural habit of the species. Apart from the use of the fruit, the medlar tree is particularly attractive as an ornamental. It has a twisted yet spreading habit, even drooping in the large-fruited ‘Dutch’, ‘Breda Giant’ and ‘Large Russian’. The flowers are large and pink-white and the foliage develops remarkable orange-gold tints in the autumn. Where space allows, a half-standard or even full-standard form will allow the tree to show its natural form and grace. Many carry large spines on older wood but those selected as the best cultivars for fruiting tend to have fewer spines. Cultivate as for apples. Large, dark brown blotches on the leaves, which may spread into the shoot, are caused by the fungus Sclerotinia mespili. Spores growing in the blotches are spread by insects to infect the flowers which develop into ‘mummies’ rather than fruits. Affected leaves should be burnt and regular sprays with a systemic fungicide may be necessary to control the disease. 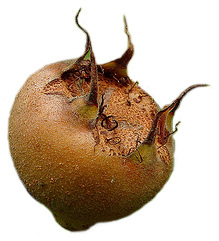 Medlars may sometimes be affected by brown rot (Sclerotinia fructigena) and powdery mildew (Podosphaera leucotricha). May also be attacked by the apple grass aphid (Rhopalosiphum insertum) and by various defoliating caterpillars.